I held off on posting anything yesterday (no one noticed, #sads) because…YOU GUYS! Today’s my three-year blogaversary! Isn’t that…weird? I think the only hobbies I’ve committed to longer were ballet class (6 years) and drumming (going on 15, and I am still no good, #alsosads). The former I was semi-forced into, the latter because…DRUMS! So, thanks. Thanks for getting me here and sticking with me through all the bluest of blue times. I have never not appreciated the kindness I’ve received thanks to this sometimes depressing, always sugar-filled press. Blog bless you all. ❤ The above is a picture of my very first brush with polenta. At least that is what it was referred to as at the sometimes-sketchy diner I often frequented in my home-hood. 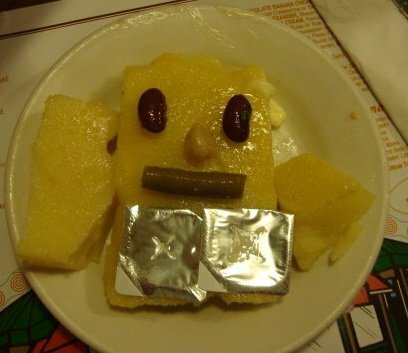 My buddy and I decided to play dress-up with it instead of, you know, attempting to consume this spongy monstrosity and having it expand inside of one of our persons. Yes, I do have recurring nightmares about such occurrences. No, I have not yet consulted a licensed professional. More on the polenta-part of this party later…. …Because lets deal with the sads first, guys! Where did you think you were, a Reading Rainbow fansite? Silly you. So yes, I am, duh, once again down in the dumps. I think I know why this time: I’m just finding out that maybe I’ve always been a little bit of a weirdo, and maybe I’ll always be a little bit of a weirdo. Fortunately I have a good little group of people who both tolerate and love the strange bird that I am, but I think I have to come to terms with the fact that not everyone will. I’ve always had trouble really connecting to people in meaningful ways– that’s a gift that I’ve always envied in my loved ones and always coveted for myself. I’m slowly finding that the number of groups I feel like I could be a member of is getting smaller and smaller the older I get. What’s the old Groucho Marx saying? “Who wants to be in a club that would have me as a member?” Indeed, sir. Indeed. I know that sounds dark and strange, but I’m actually starting to feel okay with it. Starting to. I’ve always thought of myself as an introvert anyway, and I think now I’m realizing why that is. Developing lasting, meaningful relationships is difficult enough in life for normal people, and I think I’m very lucky to have held on to the ones that I have. All of this is my very long-winded way of saying thank you for putting up with the nutjob that I am, friends and loves! Hoo-kay, now on to the sweet stuff, friends! So, I’ve been wanting to erase the horrible memory of My First Polenta– *shudder*– for years now. 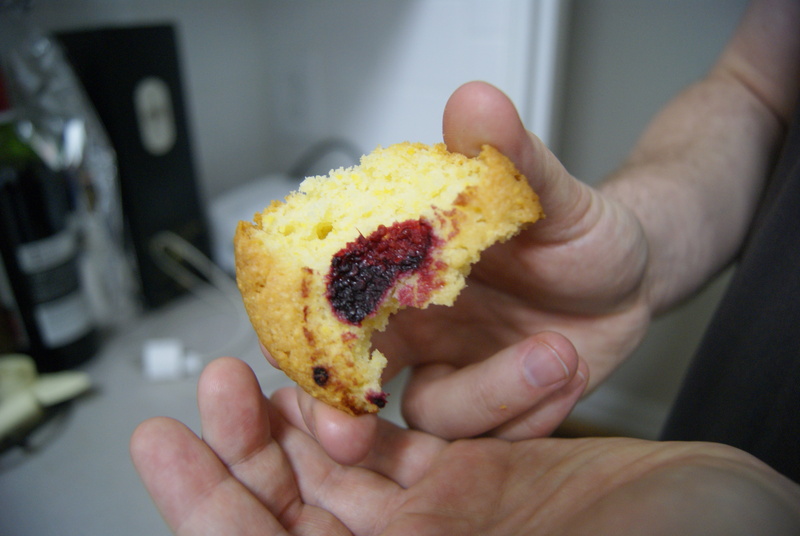 I’d finally decided to give the corn-y grain another shot at love when I happened upon a small shop in Brooklyn that sold mini-polenta cakes. Aaaand many stars, rainbows, and professions of unhealthy affection later, I decided to try my hand at baking these myself. The below confections were developed after a LOT of semi-annoying, mostly-delicious testing. Please enjoy. 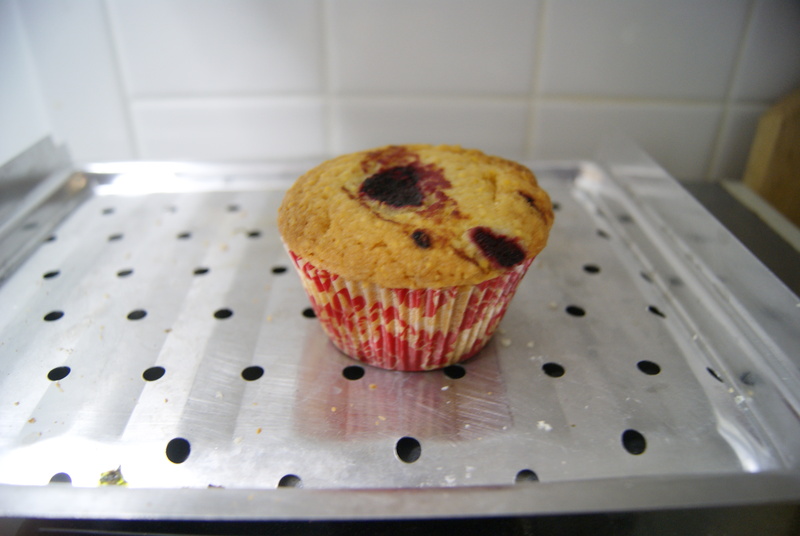 Preheat your oven to 350ºF, and line a 12-cup muffin tin with paper liners. 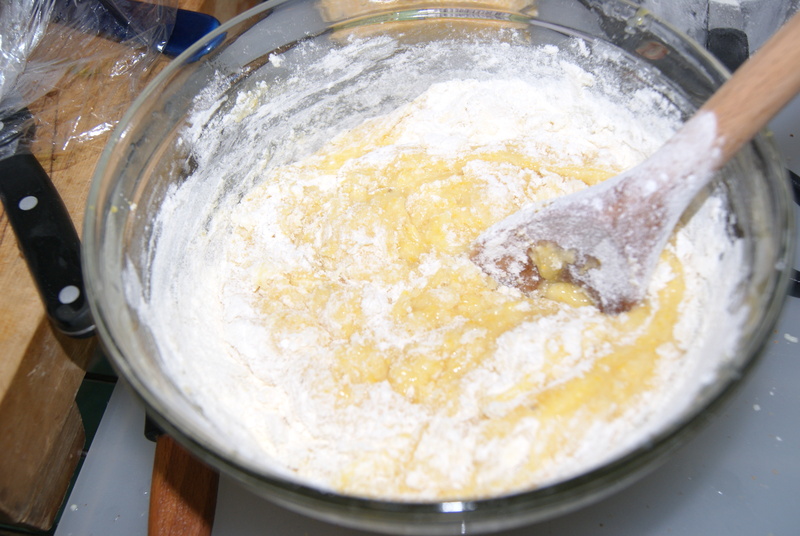 In a large bowl, sift together flour, polenta, baking powder, lemon zest and sugar. 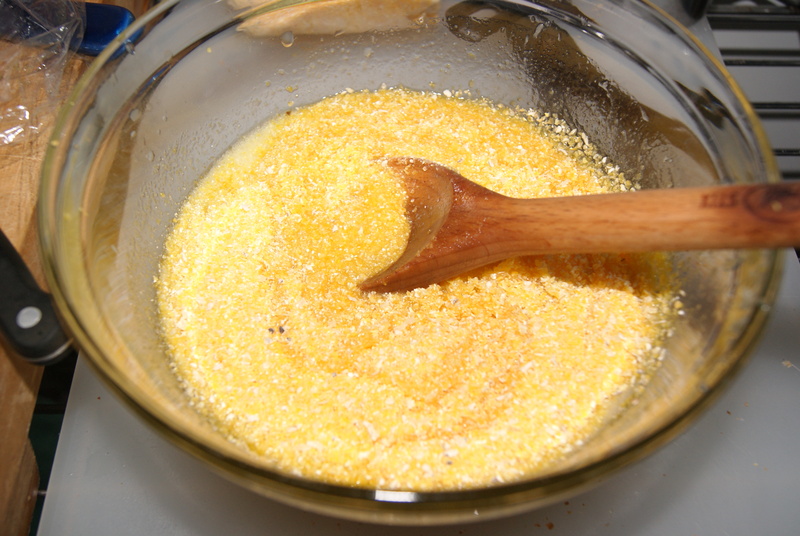 Stir in butter, olive oil and eggs until batter is smooth. Whisk in lemon juice and vanilla. Pour batter evenly into muffin cups (I find that an ice cream scoop helps in this situation). Nestle a raspberry into the middle of each cup until it’s comfy. Yes, seriously. Bake for 35 minutes, rotating the pan halfway, until the cakes have plumped up slightly and take on a golden sheen. Let cool in pan for ten minutes, then remove and let cool completely on wire racks. 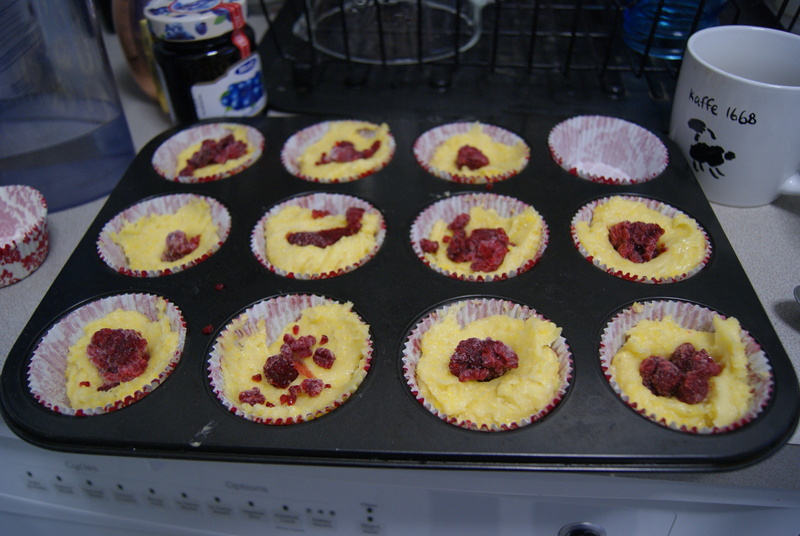 So these may not look terribly pretty, but BOY did they taste pretty… awesome. My boyfriend ate about three of them in one sitting two days ago, and then when I came home last night there was one left and…MATH! This is not a math blog either. But we loved them. The texture was gritty, crumbly and just purely amazing. Warm and butter them for a breakfast treat that is both not great for you health-wise (probably?) and very great for you emotion-wise (if you’re me?). ← Triflin’ Away The Sad Winter Days. Like, With An Actual Trifle.